ESR | March 6, 2017 | Is the GOP trying to undermine President Trump? Is the GOP trying to undermine President Trump? I have long maintained that the Republican Party is a greater threat to representative democracy than the Democrats. Although they seek to misrepresent themselves, it is no secret what to expect from Democrats. But when Republicans lie to voters with repeatedly broken promises to resist the Democrats, voters are stripped of any election choice on controversial issues. Although it is clearly the function – and obligation – of a second major party to provide opposition, Republicans repeatedly have lied to get elected and then joined forces with the Democrats. I previously have described this in detail (here, here and here). Suffice it to note here the shock and high dudgeon in establishment Republican circles that President Trump has had the effrontery to try to keep his promises. This organized Democrat effort to prevent the new president from governing with his own people – rather than being forced to rely upon leftover Obama saboteurs – is, of course, unprecedented. But it is the Republicans who should answer to those who either voted for Trump or believe he should have a fair chance. 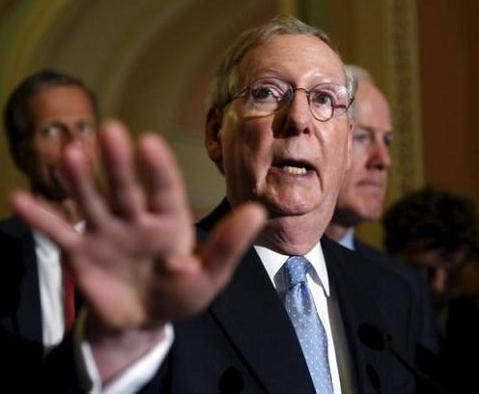 Don’t the Republicans control the Senate? And didn’t Harry Reid do them a great favor by lowering the bar for cloture on nominations? Regnery rightly says that the Senate Republicans are dragging their feet, taking time off and delaying even hearings on nominees. Regnery suggests that there ought to be a nonstop Senate session, every day and night until the Democrats get tired. But this only scratches the surface of what Majority Leader Mitch McConnell could do if he did not want to sabotage Trump. If McConnell, praised by Politico, refuses to use available tools, the president should call for a new Majority Leader. McConnell’s tools are provided both by Senate Rules and by the very Constitution that all members of Congress swear to uphold. Democrats, who never hesitate to play hard ball, are outdoing themselves by blocking nominees, some for the duration of the president’s term in office, Regnery explains. Either Republican senators should play hard ball too, or President Trump should explain to the people exactly why his nominees are being blocked, the tools available to unblock them, and the Republican complicity in the blockage. The Republican Senate majority can respond to ruthless Democrats not only with nonstop round-the-clock sessions, but by applying Senate Rule VI, which provides that no senator may be absent without “leave” of the Senate. Like roaches who check into motels but can’t check out, Democrats who insist on “debating” nominees should not be allowed to leave the Senate at all – until all Trump nominees are confirmed! Moreover, when no quorum is present, a minority of the Senate can forcibly compel the appearance of AWOL senators. Justice Ginsburg, a politican outspokenly anti-Trump, joined a 2014 liberal judicial activist opinion expanding the recess-appointment power of the president, an opinion strongly objected to by Justice Scalia and joined by Thomas, Roberts and Alito. According to Scalia, “The Court’s decision transforms the recess-appointment power … into a weapon to be wielded by future Presidents against future Senates.” Well, isn’t it well past the time, to hoist the liberal justices on their own petard and for President Trump to demand that the Senate Republicans recess for more than three days, as required by the Court’s liberal majority? To any objection that the Constitution requires that the Senate cannot adjourn for more than three days without permission of the House, the answer is simple. The Republicans control the House too. Would Speaker Ryan dare to refuse? Finally, the Constitution contains this tasty little nugget for bypassing Schumer Democrats altogether: “Congress may by law vest the appointment of such inferior officers, as they think proper, in the President alone, in the courts of law, or in the heads of departments.” Never done before? What is going on now has never been done before! Also, if obstructionist Democrats seek to filibuster passage of such a law, all that need be done is to apply Harry Reid’s nuclear option, which, after all, applies to presidential appointments. Lester Jackson, Ph.D., is a former college Political Science teacher, who has written about the Supreme Court, crime, capital punishment and American politics. He has detailed the suffering inflicted upon homicide victims and their survivors. His recent articles are collected here, here and here. He is currently completing a book explaining why capital punishment has been eviscerated and what can be done about it. Copyright © 2017 Lester Jackson, Ph.D.